SF Taxi Media: "Outrage!!!". By Brad Newsham. TWO AND A HALF YEARS AGO the San Francisco Municipal Transportation Agency (MTA) completed a “hostile takeover” of the city’s taxicab industry. Since then, all of the industry’s many stakeholders have been urged to attend twice-monthly meetings of the Taxicab Advisory Council (TAC) -- and also many periodic town hall meetings. Altogether there have been about 100 such meetings, which are designed: to promote conversation about ways to improve the taxicab industry; to try to achieve consensus and agreement among the various parties; and to move the industry forward. At its regular meeting on February 13, 2012, the TAC’s members completed voting on forty separate proposals and resolutions that have been generated during these two and a half years of meetings. One item stated, “All revenues generated by the taxicab industry should be reinvested in the taxicab industry.” Clear. Simple. Fair. On this issue, the often-fragmented industry spoke as one: the vote was unanimous, 14-0, the most overwhelming vote of the entire proceeding. Every member of the Council who was present (including representatives of the three major cab companies) voted Yes. Zero people voted No. “All revenues generated by the taxicab industry should be reinvested in the taxicab industry.” Fourteen-to-zip. Chris Hayashi, Deputy Director of MTA Taxi Services, was present at the meeting, as usual. One of Hayashi’s main responsibilities is to serve as the Council Liaison to the MTA Board of Directors. She is specifically charged with communicating to the MTA the thoughts and sentiments of the cab industry’s many stakeholders -- cab drivers, medallion holders, cab companies, dispatchers, ridership, etc. UNDER THE INDUSTRY’S current system a working cab driver has a chance to obtain one of the city’s 1,500 taxicab medallions. From 1978 until 2010, the understanding (and in fact the clearly-stated law governing the industry) was that medallions could only be held by working cab drivers -- not companies, not investors, not dispatch systems. This law has been upheld by the voters of San Francisco nine times, and has never once been defeated at the polls. The current system has put medallions into the hands of approximately 1,000 drivers, each of whom waited approximately 10 to 20 years. On the very day after the TAC’s 14-0 vote (this was on February 14, 2012, Valentine’s Day) Deputy Director Hayashi convened a town hall meeting at which she unveiled a proposal ignoring, dismissing, and reversing the entire Council’s unanimous vote just 24 hours earlier. 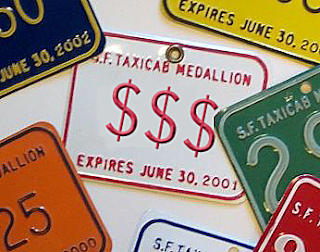 Under Hayashi’s new proposal, 500 of the city’s medallions will now be off-limits to cab drivers. Instead, the city’s largest cab companies will be allowed to lease these 500 medallions directly from the MTA for a fee of approximately $2,500 per month; the companies can then sublease to cab drivers at maximum gates. This will give the big cab companies a windfall so astonishing -- 500 medallions, one-third of the City’s fleet! -- that when company representatives first heard this proposal, they visibly appeared to be dumbfounded. Very dramatic. Great grandstanding all by a medallion holder who misrepresents himself at meetings as just a "modest cab driver". In real life this author is independently wealthy and actually writes a blog about giving his passengers free rides (which no real cab driver can afford to do) and who "out of his own kindness" pays the gate of every Green Cab driver every Thanksgiving. This author is not a "working cab driver". The facts are misrepresented here. What has been proposed is the creation of 1,500 - 2,000 new jobs and better service for the people of San Francisco. The attitude of this author is to hold the ridership hostage in the name of fair labor practices. Will you explain how converting one-third of the City's medallions to a direct-lease-system would create "new" jobs? There are drivers scheduled on these medallions already. So converting them to direct-lease medallions might bounce around schedules from driver to driver. In other words, it might take away a shift from one driver, and give it to another. But how would it create "new" jobs, as you are suggesting? Meter increase was the Trojan horse; inside resided their plan to funnel money from us to SFMTA. Board of Supervisors will not vote to have a ballot measure to remove SFMTA’s hand from our pocket because then they have to pay; which they do not have the money. Therefore, it is up to us only. If we collect $150,000 by March 30, then we can pay to collect signature to remove SFMTA by voting. Bicyclists got bicycle-lane everywhere when they started to take ACTON (CRITICAL MASS). do it. You need to do what it takes to stop the abuser. Attorney Malcom Heinicke was in Taxi Commission board. He does not go after those with money and might. He chooses easy targets: Taxi drivers, which are mostly immigrants and lack courage, ACTION and education. When he encountered tough opposition to get the medallions (thus our money), he moved to SFMTA’s Board of Director. To bring us financially to our knees, he wanted Ms. Hayashi to get our money and medallions through regulations. When she did not do all Mr. Heinecke wanted, I believe, Ms.
Hayashi lost her DIRECTORSHIP job. She is now a DEPUTY DIRCTOR. 1.SFMTA froze the expansion of the waiting list. 2. SFMTA attempted to cut the waiting list to 1100. (Now the list is close to 3000). 3. SFMTA started selling the medallion to those far away from top of the list, making close to 50% of the list lose over 500 million collectively and wait over 20 years more. 4. SFMTA indicated the desire to get 1/3 of the entire medallions to them at this step. 5. SFMTA also started the shrinking of cab companies. Now those that die so does their color scheme and dispatch. In addition, they stopped formation of new cab companies. There is no shortage of pressure, fees, and nitpicking; making it harder to operate. 6. SFMTA wants three layers only: SFMTA, then large cab companies, then gas-and-gate drivers only. No more affiliates, you would be giving your medallion to cab company for a monthly fee and drive for gas-and-gate only. In the future, not having control, your check could get smaller and your gate fee larger. To take the shock away, SFMTA is closing in gradually. We need a Court’s injunction to stop SFMTA from further damaging us then remove them through ballot. To get on email list, send an email to CHC-SF@LIVE.COM. We will not spend a dime of yours unless a group of trusted people, on the banks signature card, approves the spending. Medallion holders = $500, 1st 500 on the waiting list = $200, everybody else = $20. Please get your checks back, if there is not enough to advance our agenda. Write your check toCHC, (CHASE Act. # 913720009). Mr. Newsham is quite correct. The MTA is overstepping its mandate and putting itself in conflict of interest: it cannot reasonably be BOTH the administrator AND the beneficiary of industry monies. It cannot reasonably be incentivized to "go" and to "stop." Whoever thinks the City plan will create jobs is really crazy. A full-time medallion covers 14 shifts a week, whether it is properly in the hands of a driver or corruptly run by the City. It would be good to get a direct answer to the question, why did the TAC advise NO money to the MTA, and the Miss Hayashi seems to have made the exact opposite recommendation? I hope I am correct to believe that there is a growing sense among the TAC members, both drivers and companies, that the Council really only exists to give the illusion that the industry is involved in its own affairs. It really isn't, and the City is just pushing the industry further down the path to ruin. The first thing some people realize is that they are wasting their time making recommendations that never get past Miss Hayashi's desk. I am sure many people on the council are only there because not to serve would be worse. The illegal medallion brokers are making too much money, another cause of the ruination of the industry; why does this not get addressed? Everybody wonders, why was one of them allowed to buy a medallion? They are a much greater problem than the populace knows. Well I'll say it again as long as there is still free speech. The unfortunate thing about all of this is that the current taxi system is corrupt and change needs to occur. Every year the drivers lose more and more things while driving, you have lost insurances to certain degrees that protect drivers, medallion owners really don't care about gates and gas drivers as well as companies. The gates and gas drivers is what keeps the current system afloat. Many drivers are afraid to speak up because they may lose their jobs. Instead drivers speak up against electronic waybills because the reality is they don't want to pay taxes. As for the 5 percent credit cards it is a valid argument by the drivers, but still more people are taking taxi's because of it. Some drivers kick out gays, women, and other ethnic people they don't want in their cabs! The taxi industry needs a change, not sure this is the right change but we will see. A ballot measure I don't think will go over for the cab drivers because of the need for more taxi's on the street. I think the drivers should stop focusing on trivial things such as the 5% and electronic waybills and start on "working cab drivers, not one of whom receives a regular paycheck, sick pay, vacation pay, health care, retirement, or any other benefit." Drivers start thinking about what you are asking from the SFMTA! --- "Many drivers are afraid to speak up because they may lose their jobs." ---"Some drivers kick out gays, women, and other ethnic people they don't want in their cabs!" I am very sorry for this, for whatever that could be worth. I like gays, lesbians, trans-genders, heterosexuals, bisexuals, elderly, disabled, drug addicted going to methadone clinics, homeless with GA checks, cops, hipsters, yuppies, ethnic, rich, poor, etc. You name it. As long as there's no hassles and they pay the fare. I have, at one time or another, found all of these people to be fascinating in some way. --- "I think the drivers should stop focusing on trivial things such as the 5% and electronic waybills and start on "working cab drivers, not one of whom receives a regular paycheck, sick pay, vacation pay, health care, retirement, or any other benefit." Drivers start thinking about what you are asking from the SFMTA!" I hope to have something published on this issue before the MTA is expected to discuss one-third-direct-lease-medallions in May. Why is Dean Clark hiding behind anonyimity now, very cowardly. Damn It Doug, how did you know? I knew it Dean, I just knew it. The very same 1,500 -2,000 jobs would be created if the medallions went out to WORKING cab drivers. Very dramatic. Great grand standing to you Anonymous. Most of what you say, sneeringly, about Brad is true. Jealous much? Everything he says above is true. And documented. You are my Mayor because you deserve it. I only wish I could have said it better than Brad. and it matters not if he were a millionaire just driving for fun. trust me he is a good guy that Nate Dwiri tried to stop from getting a his medallion. Malcolm Heineke came up with a plan to take the medallions away from the current holders to which I said "This sounds like something Bush and Cheney could have come up with." Others present were much more articulate and Malcolm said he had learned from the experience. Maybe the lesson did not stick. I'll bet big money that Hayashi was directed to put this idea on paper cuz her heart is in the right place from what i can tell. I'd be in favor of a ballott measure re-creating the Taxi Commission but I know the big boys would write their own measure and outspend the well meaning folks. Failing that everybody needs to speak at the MTA board as they do not like hearing from us at all from what I hear. is up to us only. Bicyclists got bicycle-lane everywhere when they started to take ACTON (CRITICAL MASS). list is close to 3000). close to 50% of the list lose over 500 million collectively and wait over 20 years more. the desire to get 1/3 of the entire medallions to them at this step. gas-and-gate only. In the future, not having control, your check could get smaller and your gate fee larger. further damaging us then remove them through ballot. people, on the banks signature card, approves the spending. 1st 500 on the waiting list = $200, everybody else = $20. Majority of cab drivers are not active to prevent damage to their future income. They think God would do it for them. Anybody out there close to God? We need a lobbyist in every established religion. Seriously, I have a proposition for the head of houses of God. We might be able to raise the $150,000 that way.